Kilimanjaro Safaris at Animal Kingdom is an attraction that should be experienced both during the day and at night. 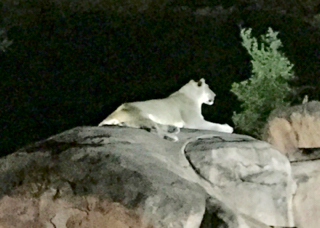 Certain animals are more active at night, including the lions. I took this shot of a female lion a few weeks ago. A male lion was also awake and active that night, but there wasn't enough light on him for a good photo.